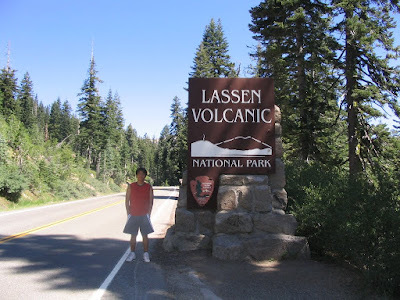 The day before, we already made up our mind to do the Bumpass Hell and Lassen Peak trail on the same day. When we started at the Lassen Peak trailhead, it was already close to noon. 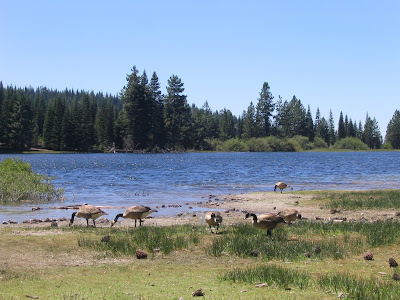 Having only eaten some snacks for breakfast, we agreed on skipping lunch entirely and treat ourselves to a good dinner after finishing the Lassen Peak trail. In retrospect, this was a crazy move. 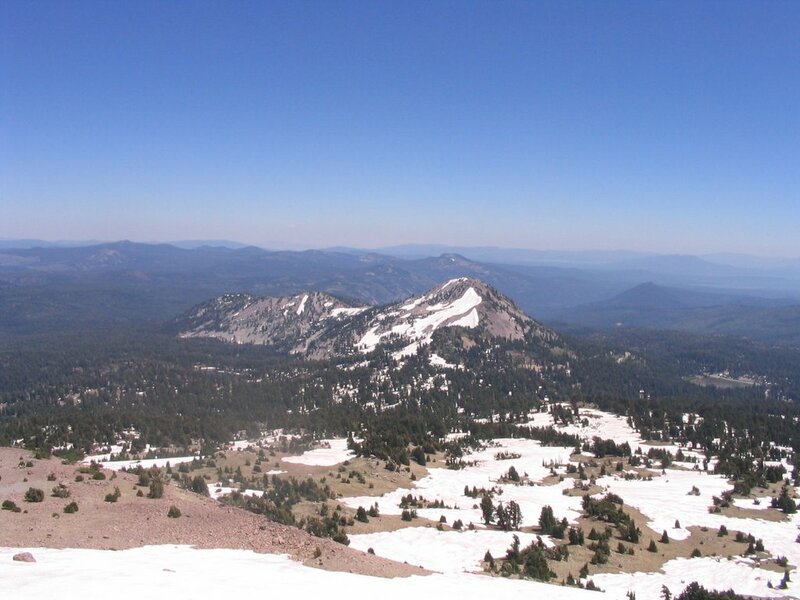 Lassen Peak erupted in May 22, 1915, after minor activity a few days before. It wouldn't be until 1980's Mount St. Helen's eruption would people witness an eruption of this kind of scale in the United States. Fortunately, the lahars that flowed down two days ago made the owners of the summer ranches nearby aware and thus evacuated immediately, preventing any fatalities during the major eruption. 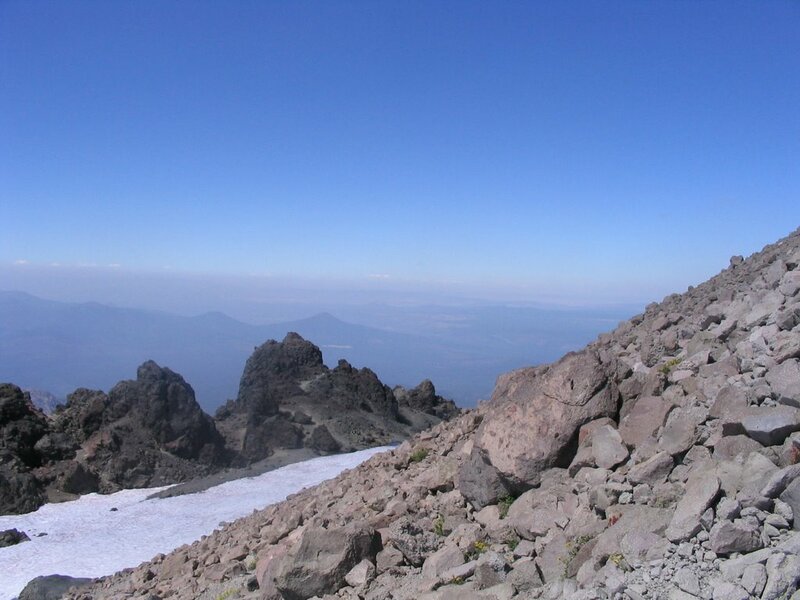 The major eruption's lahars swept down the northern side, and the so called Devastated Area remains sparse in terms of vegetation even today, due to the nature of the soil unable to sustain plant life. The Lassen Peak trailhead starts at 8500 feet. 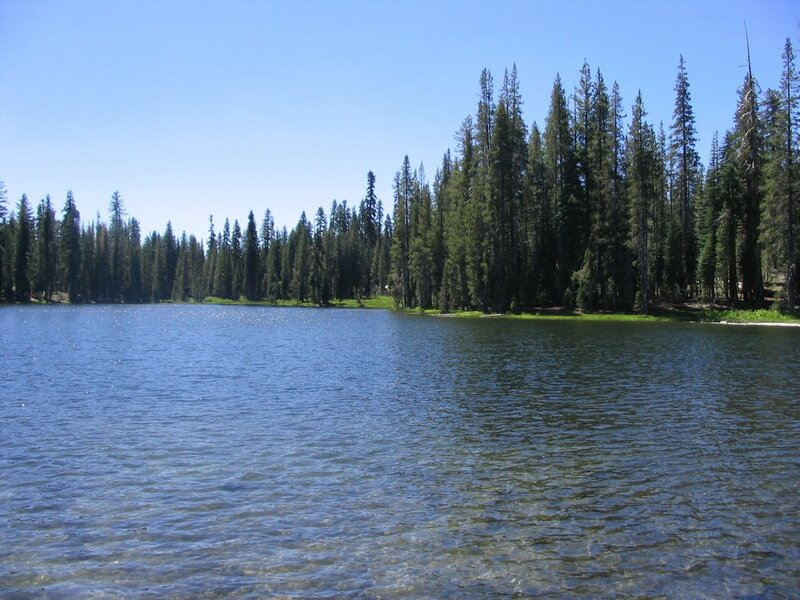 The trail is 5 miles roundtrip, but the trail ascends 2000 feet, a considerable gain for a 2.5 mile hike. 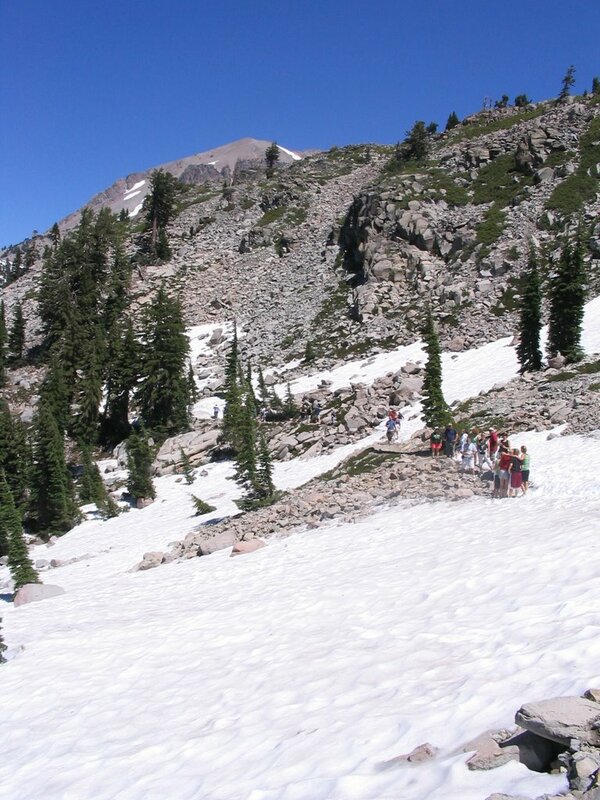 To make this hike more challenging, parts of the trail were still covered with snow and were not cleared out. Wearing the same old sneakers we do back at school, by no means were we well-equipped at all. Unlike Bumpass Hell's snow covered ground which was flat throughout, here you are actually facing the edge of the cliff on one side. Any slip in the wrong direction could easily mean instant death. Some of the narrow snow-covered paths also had to allow traffic in two directions, which involved courteous coordination from the hikers. 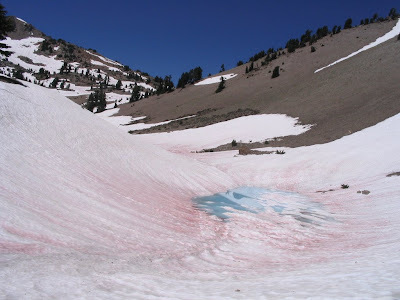 On the snow, you can see something red seemingly powdered on top of it. Thinking it was some kind of mineral, it turns out to be a kind of green algae called "snow algae." Not only loving to grow under extreme cold conditions, in addition to chlorophyll, they have a second red pigment to protect against the strong UV radiation and store more energy. Mostly dormant during the winter months, they spring to life (pun intended) in the warmer seasons. Supposedly they give off a fresh watermelon scent, which earns them the other name "watermelon algae." My allergic nose didn't seem to catch the scent. 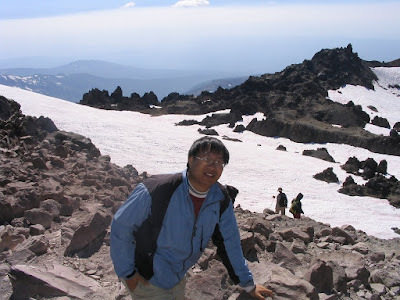 The trail to the peak is steep with very loose rock and soil, with many switchbacks. The distance markers often are very misleading, seemingly giving the direct distance to the peak instead of the actual physical trail distance. The amount of ground we covered during the first half seemingly was just as much as the second half, but the second half was disproportionately shorter according to the park signs. Many times we would be spending half an hour or more to inch ourselves by merely 0.2 miles. This is a view midway through the trail. These mountains are remnants of an ancient volcanic mountain Mount Tehama which started to form around 600,000 years ago. 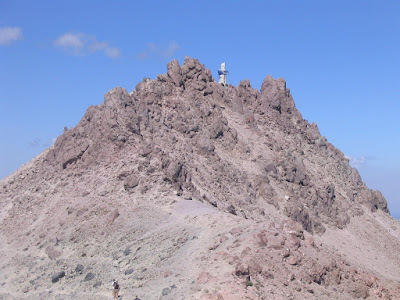 It would rise to more than 11,000 feet, but it would collapse after successive eruptions. 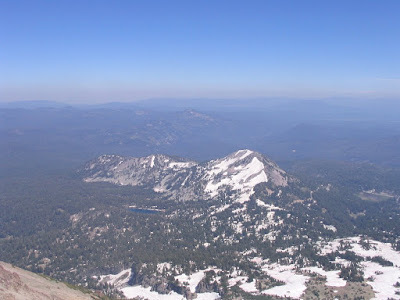 Brokeoff Mountain, the peak on the far left, is now the tallest part left of Mount Tehama. 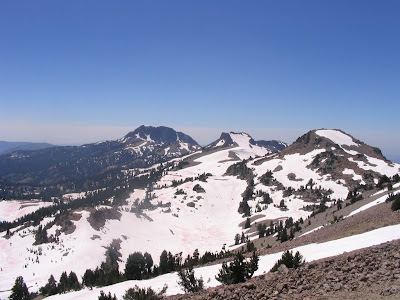 After Lassen Peak, it remains as the second largest peak in the park. 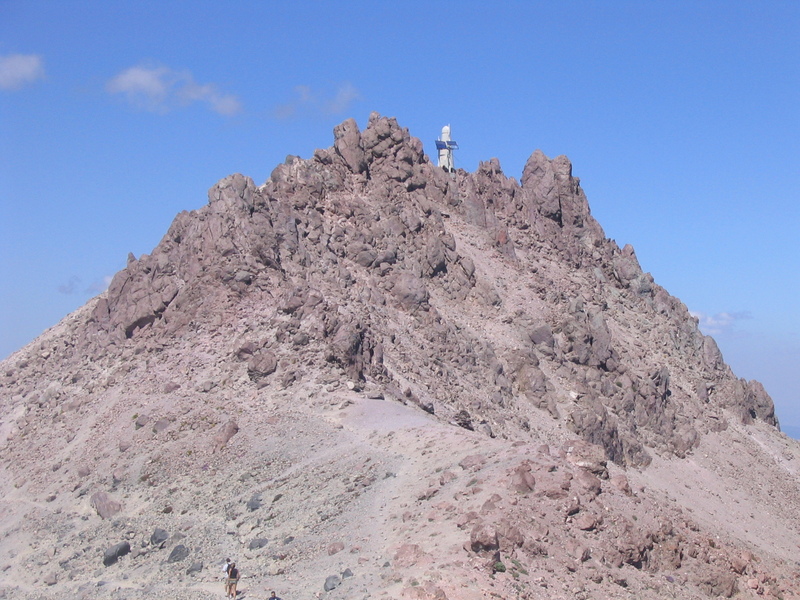 View near the summit. An additional elevation of 2000 feet does make the view more breathtaking. 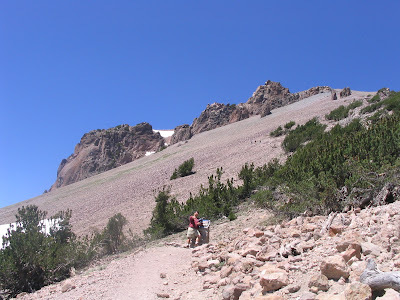 This is the final stages of the Lassen Peak trail, arguably the toughest part of the hike. 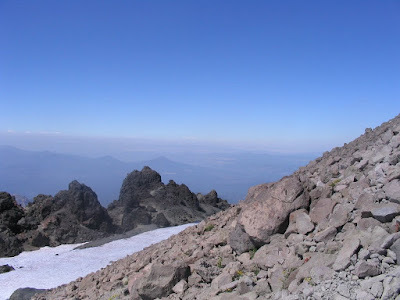 Being even steeper and rockier, there are no paved out trails in the ascent to the final peak. Instead, rangers have red flags marked within the cracks to guide the hikers. 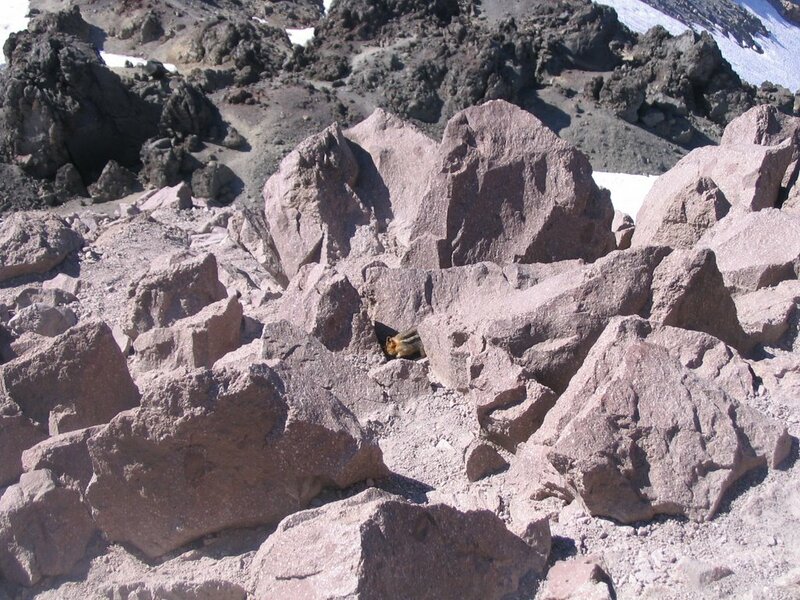 If at first you can still seemingly walk up the rocks, it turns vertical quickly, forcing you to get down on all fours to crawl the final meters. You might look ridiculous, but so will all the others before and after you. View on top of Lassen Peak. 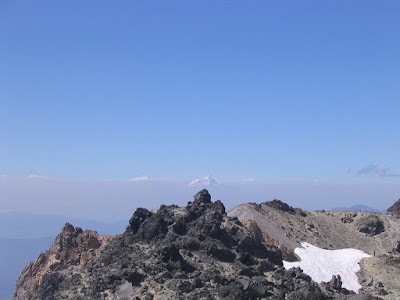 Mount Shasta visible in the northwest horizon. 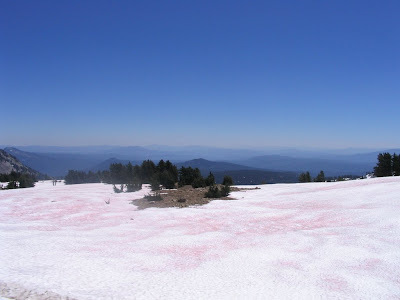 Mount Shasta is the second highest peak in the Cascade Mountains, second to Washington's Mount Rainier. 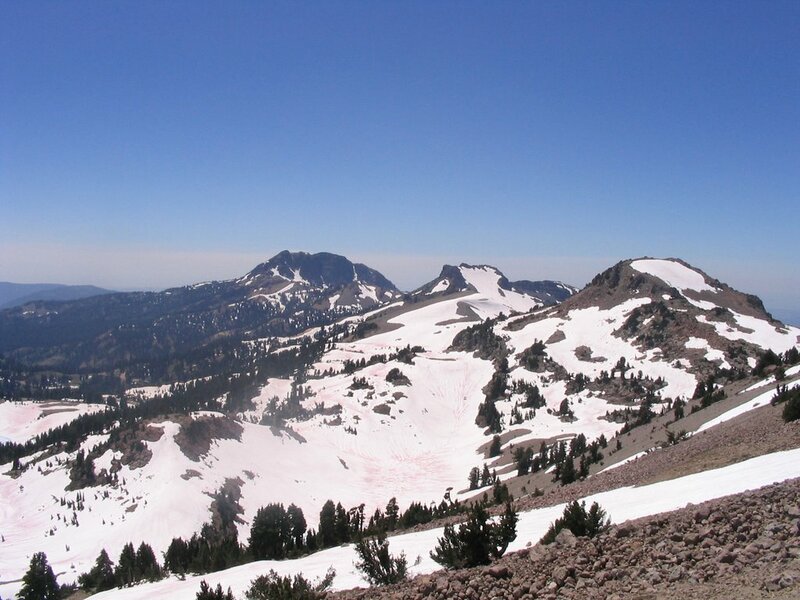 It is higher than Lassen Peak by around 4000 feet. where did this little fella come from? 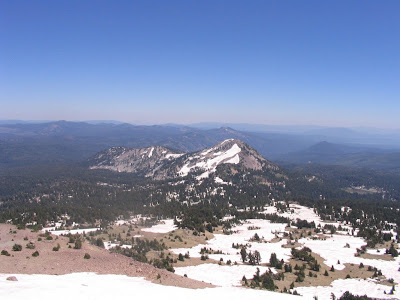 On Lassen Peak, with trail in the background. It'll be a long way down. I had a much easier time going downhill, as I normally do anyways. The trip down took maybe half the time it took to go up. Lassen Peak trail also turned out to be one of the more challenging trails I have done in a while since going to Yosemite a few years back. It would boost my confidence and understand my limits. As for being ill-equipped, I started out with only two bottles of water. Needless to say, I was all out by the time I was at the top. Thirsty and tired, an American dad who carried has son (!!!) throughout the latter half of the hike had an extra sandwich and a bottle of water, which he nicely shared with me. We encountered him when he started out hiking the Lassen Peak trail, where we each passed each other during numerous occasions along the hike. In the end, he was able to beat us to the top with a kid on his back. However, having learned that we did the Bumpass Hell trail earlier, he was genuinely impressed. We stopped by Chester for dinner the day before and noticed the large lake in the area. Before entering the park on our last day, we decided to make a stop at Lake Almanor first. The lake is actually an artificial lake, dammed up to generate electricity for Plumas County. 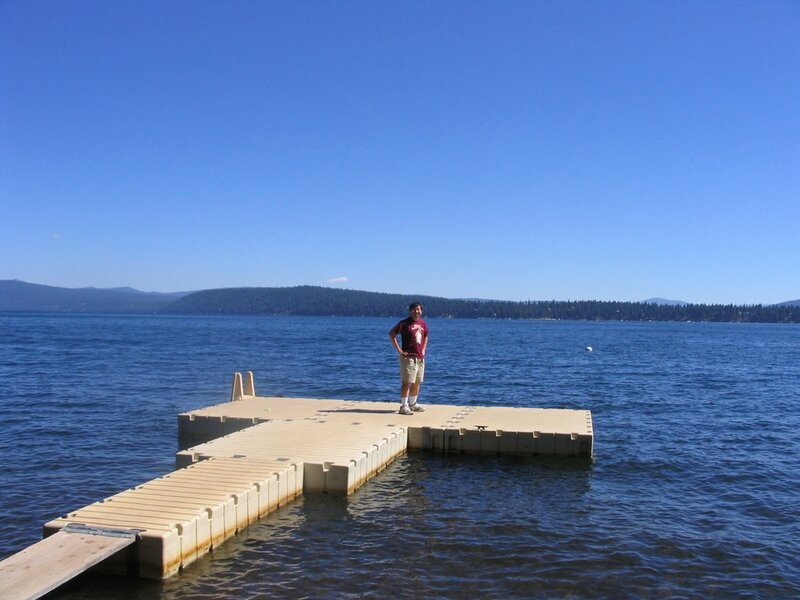 Despite its practical existence, Lake Almanor is popular for its summer water sports. Driving in the neighborhood, we could not help noticing that every household had a motorboat parked in their yard. Marveling at the number of wealthy people that are able to lead such luxurious lives, it was also clear that these houses were just their summer resort getaways. Where they actually lived most of the year is a total speculation to us.